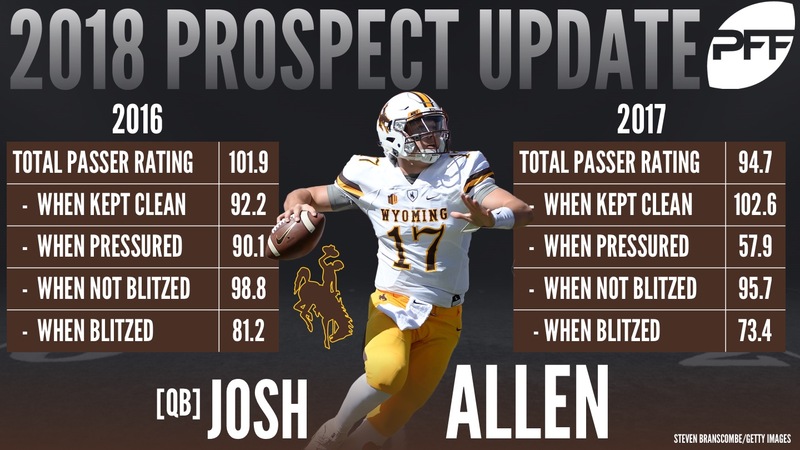 In late September, I was part of PFF’s grading team assigned to the early season matchup between Wyoming and Hawaii, meaning it was a prime opportunity to break down Cowboys’ quarterback Josh Allen, who was already one of the most polarizing prospects at the time. With the 2017 season now complete, little about his play since has changed the minds of people on both sides of the spectrum. His physical tools are undeniable: He’s listed at 6-foot-4, over 230-pounds, he possesses a huge arm and excellent athleticism, his natural skill set pops off the film and sets him apart from the rest of the class. The rest of his game, however, raises significant concerns about his ability to translate to the next level. Accuracy is one of those significant issues, especially downfield. In 2017, he completed just 13-of-42 downfield throws (balls that travel 20-plus yards through the air from the line of scrimmage), including just 1-for-13 on deep shots to the right of the numbers. 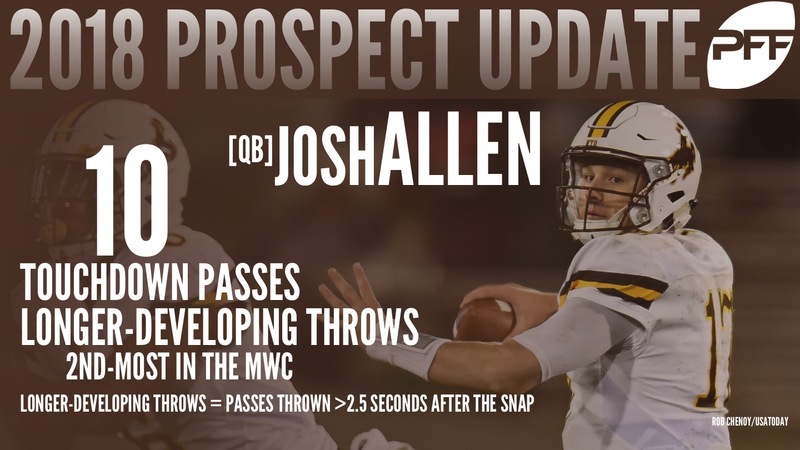 When eliminating drops, throw-aways, spikes, balls batted at the line of scrimmage and throws knocked off the mark by a hit absorbed during the throw, Allen completed just 65.7 percent of all of his throws, which ranked 86th in the country among draft-eligible quarterbacks. He also struggled significantly against pressure, as his 51.4 adjusted completion percentage when affected by the rush ranked just 79th among draft-eligible players at the position. His 55.4 passer rating ranked just 60th in that same peer group. Being kept clean from pressure didn’t help him improve his ranking either, as his 71.8 adjusted completion percentage from a clean pocket ranked just 72nd. The notion that he played significantly better in 2016 because of better talent around him is easily debunked statistically. His adjusted completion percentage in a clean pocket last year was slightly higher at 72.6, and against the rush, he was also marginally better at 53.5. His overall passer rating was about 12 points better last year at 95.6, but had he posted that number this year, he would still rank just 40th among this year’s draft-eligible signal-callers. The aforementioned Hawaii game was fairly average by Allen’s standards. His overall grade for the game was 70.3 (for the year he posted a 73.6), but his passing grade for the game sat at just 57.9. On attempts 10 or more yards from the line of scrimmage, he completed just two of his nine throws for 41 yards and a score. While he completed just 9-of-19 total attempts, it is worth noting that two of his incompletions were drops, and another was batted down at the line of scrimmage. Overall, he had a passer rating of 79.3 for the game, certainly not a figure expected out of a top draft prospect against an opponent the caliber of Hawaii. Three throws in particular stood out in this game, as they displayed many of the positive and negative traits he’s shown throughout the past two seasons. These plays show some of the skills that have anonymous NFL scouts salivating, as well as the parts of his game that make him look like a Day 3 dart-throw. I tweeted each of these plays out in September, and knowing now how relevant they remain in describing his game, they warrant further exploration. This throw is the NFL’s litmus test for arm strength, one that had scouts in awe of Carson Wentz in 2015 when he entered the NFL via North Dakota State. His receiver runs an out cut to the far side of the field from the opposite hash, making it one of the most difficult throws to complete in football. Hawaii actually does a respectable job defending this play, as the cornerback gets good depth from his underneath positioning, and the safety is late only because the ball is placed so perfectly in stride to the receiver, right on the boundary. The cherry on top is the fact the receiver drops the pass, feeding the notion that Allen just didn’t get the same level of help this year he did from his skill players in 2016. This is the type of throw sure to have some coaches ready to toss the bad out the window, as very few current NFL quarterbacks can make this throw with the level of velocity and accuracy Allen did. This is the same route as the prior play, ran to the wide side of the field from the left hash, this time at a depth of 10 yards as opposed to 20. A completion would have again been difficult considering the tight coverage, but Allen gives his man no chance, as he airmails the pass so badly, it looks like a throw-away. Some of his critics have taken to comparing him to Christian Hackenberg, who flashed a similar physical skill set coming out of college but struggled with wild accuracy, and this throw by Allen is very reminiscent of what we saw from Hack in 2015. It’s third down, only need four yards for the conversion, Allen tries to complete a short out to his slot receiver, who runs to the sticks. He stares down his receiver the entire way, paying no heed to the fact the cornerback has given up no space in his pedal and is essentially baiting this route. Allen compounds his mistake by throwing it slightly behind his target, and the defender is able to instantly jump the route. Luckily for Allen, the defender drops the interception, which almost certainly would have been returned for six the other way. This play is indicative of his struggles to understand defensive coverage schemes and his reckless willingness to rely on his arm to bail him out of bad decisions. His games are littered with plays similar to the ones shown above, making it easy to see why there appears to be very little middle ground in his evaluations. Major media outlets remained convinced that Allen will be a high first-round selection in April, and they very well could be right. The NFL has a long history of gambling on traits at the quarterback position because of its central importance to the success of the franchise. However, Allen’s repetitive accuracy and decision-making issues, which are consistently backed up by our analytics, are more fitting of a late-round prospect.